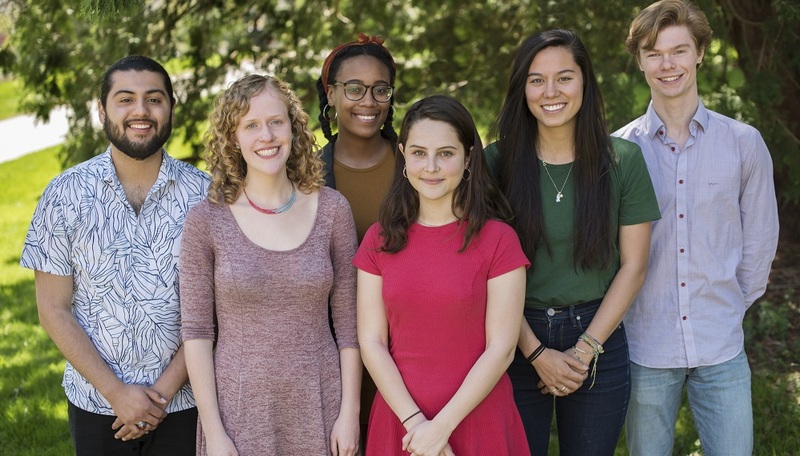 Through their monthly blogs we've seen how the Haverford House Fellows work to connect Haverford students with people, places, and organizations in Philadelphia. Here we learn how they have deepend their engagements through non-profit work across the city. Sabea Evans '18 works with the Center for Hunger-Free Communities, a community engaged research, advocacy, and policy center of Drexel University’s Dornsife School of Public Health that works to develop innovative and empirically-tested solutions to the challenges of economic and food insecurity in Philly. Sabea’s ongoing projects include program development for the Center’s advocacy efforts and collaborating on research and policy briefs on the relationship between discrimination and food insecurity, systemic oppression as a form of trauma, and trauma-informed two-generational approaches to poverty alleviation. Callie Kennedy '18 works as Program Coordinator for Puentes de Salud's elementary afterschool program, in addition to supporting programming for middle schoolers. Callie supervises volunteers while working to coordinate high quality programming for students that is rooted in bilingual literacy, movement, and art. She is currently excited to be working with a friend and colleague who will facilitate sexuality-based education with the 5th grade students this spring. Claire Michel '18 works with the Committee of Seventy as a Public Policy Fellow. She helps create the voter guide the organization puts out every election, helps to maintain their social media and website. Claire's current project includes writing and organizing a state of Philly politics report and reorganizing the website to make it more accessible for voters. Sara Ozawa '18 works with Pennsylvania Horticultural Society's Community Gardens team as a community outreach specialist. Her contributions to the organization include connecting with gardeners and farmers across the city and updating the informational database for the City Harvest program to ease communications going forward. She has also been involved in the strategic planning process on how to evolve the Gardens team's scope in order to better meet the needs and expectations of the network. Jason Sanchez '18 works with Community Legal Services as a paralegal in the Housing Unit. He helps educate clients facing eviction on their rights as tenants and works collaboratively with attorneys to help determine potential representation for clients in Municipal Court. TJ von Oehsen '18 works with Education Law Center, whose mission is to ensure access to a quality education for all children in Pennsylvania. TJ's work has involved compiling special education funding data for all 500 school districts in the state of Pennsylvania, assisting in writing ELC's report, "Shortchanging Children with Disabilities: State Underfunding of Special Education in Pennsylvania" that was released alongside of that data, and visiting Harrisburg to meet with allies and legislators that will hopefully help move ELC's mission forward. He is currently finalizing a report that is being prepared by request of the newly appointed Philadelphia School Board regarding equity and funding in the charter school sector. Haverford House is a part of the Center for Peace and Global Citizenship at Haverford College. The CPGC supports campus-wide commitment to peace and social justice through Fellowship opportunities, funding for student and faculty research, organizing lectures and workshops, and developing community-engaged coursework. Students interested in learning more about becoming a Haverford House Fellow can do so here and can contact Janice Lion, Associate Director of the Center for Peace and Global Citizenship, at jlion@haverford.edu. Be sure to follow Haverford House on Facebook and Instagram to keep up with their monthly house programs and gatherings!